BlogHome » Blog » Whose son is Simon? Bellarmino Bagatti originally read this inscription from right to left, as one would normally approach reading a Semitic inscription. He assumed that the national script that he was reading was the normal Jewish Aramaic script (with cursive tendencies), that was the predominant script among the ossuary inscriptions he had read thus far. He could quickly read the first name shin – mem – ayin – waw – nun = SHM‘WN, “Shimon” or “Simon” (although mem and ayin were a little unusual). The next word that would naturally be anticipated was “the son of” normally the Aramaic word beth – resh = BR, “bar”, and so it was, (but, again, with an unusual resh). Pushing on, he had to make sense of some unusual letter forms which, combined, and with a bit of imagination he took to be: yodh – waw – nun – heh, YWNH, “Yonah” or “Jonah” (in which case, as it turns out, not a single letter was read correctly). The final editor J.T. Milik in 1958 was more cautious. And although he did not reject outright the earlier reading as possible, he did suggest some alternatives for the patronym (i.e., father’s name; the third word in the inscription). Beginning with the last letter, this is apparently the most significant letter for identifying the national script of this ossuary inscription. The precursor of this form of alef can be found in the script known as “Seleucid Aramaic” script (cf. J. Naveh, Early History of the Alphabet: An Introduction to West Semitic Epigraphy and Palaeography. Jerusalem, Magness Press, (1982), pp. 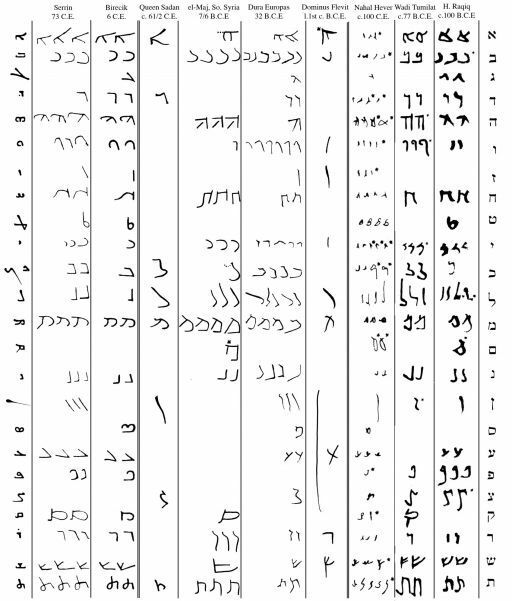 147-151; “An Aramaic Inscription from El-Mal – A Survival of the ‘Seleucid Aramaic’ Script”, Israel Exploration Journal 25 (1975), pp. 117-123). 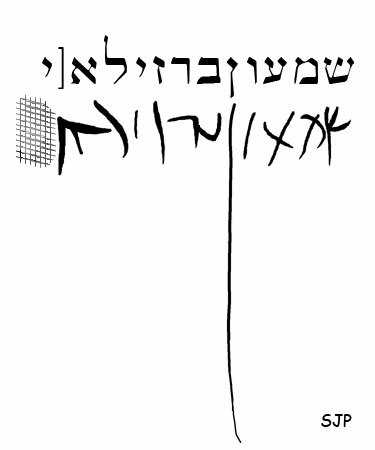 The inscription, which was drawn at least twice, reads: “SDN MLKTA.” This inscription shares several letters in common with the Simon ossuary from Dominus Flevit (DF 11), including alef, mem, nun, and dalet/resh. 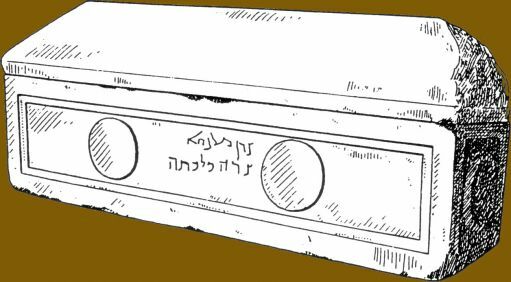 In the drawings of both Pirrene and Naveh, the final letter, the alef, is strikingly parallel to the alef in the Dominus Flevit ossuary. The mem does bear some resemblance to that of the Dominus Flevit exemplar, but the left stroke pierces through the top of the right stroke. Dalet in the Syriac family of scripts is normally identical to resh. 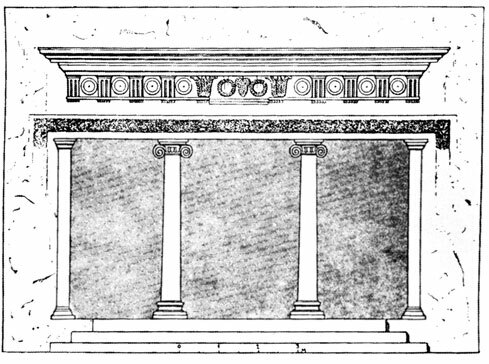 That being the case, the form of the dalet of the Sadan inscription is quite similar to that of the resh of the Dominus Flevit inscription. The final nun resembles that of DF 11, in that its tail curves or tilts backward under the word, as is typical of the Seleucid family of scripts, including Syriac and Palmyrene. The main difference between the two drawings has to do with the reading of the lamed (“L”, the second letter in the second word). The lamed is a diagonal line (potentially ending with a curve leftward – Pirenne). When we compare the letters to the exemplars from the Seleucid family of scripts above, a new reading emerges that is not beset by problems. The first letter of the patronym has a shaded head and form similar to the zayin of other exemplars from this script family. The second letter is clearly a yod, and is too short to be read as a waw. The third letter of the patronym appears closest to the lamed of the Seleucid Aramaic script and does not resemble the nun of the local Jewish Aramaic script nor of any other contemporary script. And the final letter, as noted above, is actually alef. 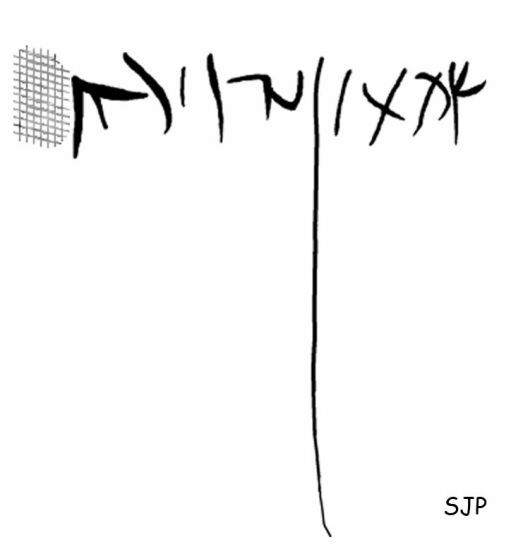 The cursive Seleucid Aramaic alphabet of this inscription; The new reading of the inscription: “SHIMON BARZILLA[I]”. 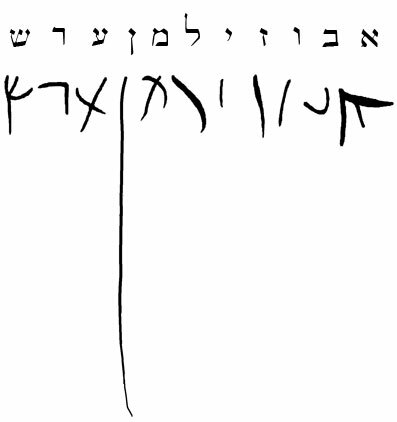 The patronym, based on Seleucid Aramaic script, should then be read as “ZYLA” and the full inscription as “SHM‘WN BR ZYLA,” “Shimon Bar Zilla.” Photos indicate some surface erosion exists to the left of the alef, which may allow for another letter, for example a yod, which would yield the reading SHM’WN BR ZYLA[I], that is, “Simon Barzilla(i)”. Milik’s suggested reading “Shimon bar Zinah” is closest to our reading. However, he neglected to note the Seleucid Aramaic alef and the lamed. This new reading does, of course, exclude “Simon Bar Jonah” from the options and returns the discussion of the potential location of Simon Peter’s bones back to their traditional place, Rome.